Bonsai involves growing plants in a confined situation. 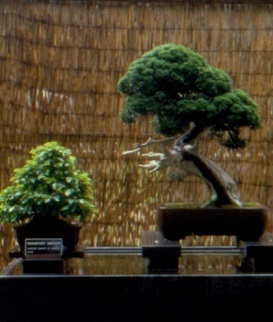 In contrast to the beliefs of some, growing bonsai is not an act of cruelty - although it involves confining root growth and regularly pruning the roots and top of the plant, it can be kept in a miniature form for hundreds of years (in some cases) and can vastly outlive its relatives which are growing in the wild or in gardens. Like other trees and shrubs, the bonsai is still able to produce flowers and fruit if it is given suitable care and attention. The bonsai should look like a miniature tree, with not only the trunk and branches scaled down, but also the leaves. As such, it is preferable for bonsai to utilise smaller leafed plants. You will discover ways of using bonsai both indoors and outdoors. During the course you will have the opportunity to develop your own personal bonsai style and techniques with the support of your tutor. Resources reference books, organisations, magazines and journals, nurseries, bonsai shops, seed suppliers and the internet. Cutting Propagation stem cuttings, hardwood cuttings, semi-hardwood cuttings, leaf cuttings, leaf bud cuttings, root cuttings, factors affecting rooting of cuttings, striking cuttings, after care. Other Propagation Methods layering, air layering and grafting. Principles of Design roots, trunk and branches. Root Evaluation in the Initial Stages of Bonsai potting the Bonsai, rock planting, clasped to rock design and root over rock. Soils Soil composition, colloids, structure, texture, chemical properties, improving soils, improving texture, improving structure, improving fertility. Growing Medium Mixture functions of a growing medium, properties of a growing medium, drainage, water retention and colour and appearance. Common Pest Problems on Bonsai eg. aphids, borers, caterpillars, scale and thrips. Watering and Fertilising Bonsai symptoms of water deficiency, symptoms of excess water and fertilising. Maintenance Pruning for Bonsai removing dead/diseased wood, controlling the type of growth, controlling shape and size, rejuvenating, leaf cutting, basic rules of pruning, points to consider when pruning. Principals of Landscape Design with Bonsai and the applications they can have in creating your garden. Landscape Applications for Using Bonsai group plantings, ssaikei, bonseki, bonkei, miniature gardens, rock gardens, water gardens. Research a particular aspect of bonsai of interest. Demonstrate knowledge of the plant kingdom, an understanding of the taxonomic hierarchy, and an appreciation of the types of plants suitable for bonsai. Understand methods of propagation used in bonsai. Learn the species of plants most suited to bonsai. Learn a range of bonsai styles and techniques used to achieve them. Understand the process of creating bonsai. Understand the basics of successful bonsai culture. Understand landscape design principles to better create bonsai landscapes. Carry out research into a particular aspect of bonsai of interest to the student. Develop plant review sheets for 24 plants suitable for bonsai. Make up a list of resources/contacts useful to a bonsai grower. Research what constitutes a good propagating mix. Visit a nursery and observe the nursery stock present to assess suitability for bonsai production. Propagate two different species of plant that have the potential to be used as Bonsai. Obtain three plants and determine the style of bonsai each plant lends itself to. Make a list of the most commonly grown varieties of plants you consider as being used for bonsai today. Visit a bonsai house, bonsai farm, bonsai nursery or other facility where bonsai are available for viewing and classify the style of at least 10 different bonsai plants. Obtain soil from two different types of soils; test the soils for drainage, and name the soils. Obtain (or make up) a potting mix which you consider appropriate for growing bonsai in. Conduct tests to name the potting mix you have obtained. Test the drainage of the potting mix. Visit a nursery or garden growing bonsai plants to assess the plants for pests, diseases and environmental anomalies. Using your knowledge of landscaping principles, decide on the best outdoor locations three different bonsai, and the optimum indoor locations for short term display. Take photographs or sketch the locations in which you would place the bonsai. Submit these photographs with your assignment. Obtain plants of different varieties which can be used in the topic you are studying for your special assignment. Using what you have learned in the course, turn your chosen plants into bonsai and either photograph or draw what you have created. Write a 1500 word essay on the topic you have selected. Supplement this with drawings and/or photos of the two bonsai plants you have created. How Do You Maintain a Bonsai Plant? Bonsai may not need pruning every month, but if you want them to look good, and retain value, they need to be pruned routinely. Faster growing plants are pruned more often; and slower plants less. When pruning start at the bottom of the bonsai and work up. You can use pruning to shape the plant to produce an instant result from a suitable small shrub or tree obtained from a nursery or garden centre. You might prefer to select a deciduous tree and prune it in winter when the leaves have been shed and the shape of the trunk and branches are clearly visible. An ideal specimen would have a reasonably wide trunk and enough branches to balance the density of the trunk. The branches should have sufficient twigs growing from them close to the trunk. This method is a form of subtraction i.e. you begin with a bonsai and cutting out branches and twigs to arrive at the final design. Start by removing any straggly or leggy shoots below the major branches. If the lower trunk needs to be wired and shaped, do this now. This will set the scene for the rest of the structure. To decide on the final shape, it can be helpful to tilt the plant from side to side. Sometimes a different perspective will give inspiration as to the shape you wish to attain. Continue the wire up the full length of the trunk, but wait until later to reshape the top section of the tree. If the lower branches are to be retained and require reshaping, wire and reshape them now. In general, if the trunk is very straight, keep the lower branches straight. In the same way, if a trunk has a pleasant curve then balance this by curving the lower branches. Consider the ratio of the trunk height to the length of the branches. In general, the length of the trunk to the lowest branches should be about one third the height of the entire trunk. This is only a general guideline, so experiment a little as your experience increases. The length of the major branches should be less than half the height of the entire trunk, and obviously the minor branches will be shorter than this. Try to avoid having branches directly opposite each other. It is more aesthetically pleasing when branches are slightly staggered, in groups of three. If you shorten the bonsai by taking the top off the top of the major trunk, you may wish to disguise the cut by wiring and bending a nearby branch to continue the form of the main trunk. Begin working on the upper branches. In general, it is effective to retain progressively smaller branches as you proceed up the trunk. Try to avoid branches directly above one another. This can be avoided by either removing a branch or wiring them into a different lateral position. Try to achieve a structure where branches are present on both sides and the front and back of your bonsai. Most importantly, do not make the tree appear too uniform – it will appear unnatural. Branches that are evenly spaced all the way up the trunk will look more like a man made structure than a tree in nature. After shaping the bonsai structure, there may be left over unwanted foliage and branches. Remove these now. Caring for bonsai is different to caring for other plants in a number of ways. While it is not particularly appropriate to discuss bonsai care in any great detail in this book; it should be noted that there way you care for a bonsai does have a bearing upon the way you prune it. Feeding, watering and repotting to replace the growing media (potting soil), will replenish the nutrients that are removed when a bonsai is pruned. Excessive replenishment of nutrients will cause excessive growth, and make it more difficult to control the shape and size of the plant. Inadequate replenishment can stress the plant and make it more prone to health issues. This course is only the starting point for a love affair with bonsai that may well last your entire life. You will develop a foundation for growing your knowledge as well as an expanded awareness pf what is possible and how you might achieve ever better results with bonsai. You will no doubt grow your own collection of bonsai, increasing and improving what you are growing, every year that passes. Some students make a career or part time business out of bonsai; and for others it is their hobby. Whatever your goal, this course can be a significant step forward for you into the world of bonsai.